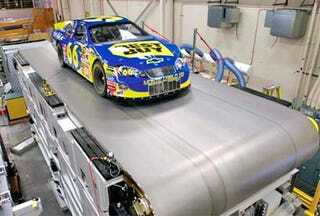 Check this full size Nascar sitting on top of a steel belt sliding at 180mph. While wind tunnels have been used to design cars for years, the results can be affected by the fact that the ground is still. This machine solves that problem, in truly dramatic and dangerous fashion. Just like NASCAR itself. The image after the jump shows how giganormous this thing is.